Taiwan denies rumors about leasing Taiping Island to U.S.
Taipei, June 11 (CNA) The Ministry of Foreign Affairs (MOFA) has categorically denied a rumor that Taiwan was planning to lease Taiping Island in the disputed South China Sea area to the United States. "The government has no plans to lease Taiping Island to any other country," MOFA spokesman Andrew Lee (李憲章) said late Sunday, adding that neither the United States nor any other country had made such a request. "The fabricated report was meant to create instability in the region or conflict between the two sides of the Taiwan Strait," Lee said, referring to a news report on the issue on the China-based news site www.xilu.com. "All parties must stop spreading that rumor and refrain from attacking the Republic of China (Taiwan) government for such a groundless reason," he said. The ROC is a constructive member of the international community and will deal with issues related to the South China Sea based on the "four principles" and "five actions" put forth by President Tsai Ing-wen (蔡英文) in July 2016 with the aim of making Taiping Island a hub for international assistance and scientific research, Lee said. Under the "four principles," the ROC government thinks all disputes related to the South China Sea should be resolved peacefully in line with the United Nations Convention on the Law of the Sea to guarantee freedom of navigation in and overflight over its waters, he said. Furthermore, the ROC’s stance is that all military construction and other actions that could accelerate regional tensions must be stopped to ensure peace and stability in the region, Lee added. The five actions put forth by Tsai are to safeguard the ROC’s fishing rights and its rights to participate in multilateral negotiations, to promote scientific cooperation, to strengthen humanitarian response and to continue nurturing and encouraging research talent in the law of the sea. 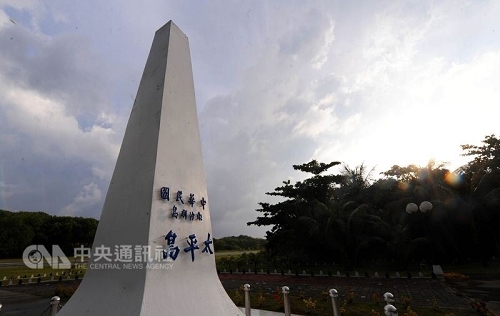 Taiping Island, located some 1,600 kilometers away from Kaohsiung, is 0.51 square kilometers and has 200 ROC troops stationed there but no civilian residents.